I've found some online lists of Yo! Sushi values which are really old and wondered if someone could help me out with some of the newer stuff? I've been saving syns so I'm not too worried about the total amount but I'd like to be able to record it in my diary. Thanks! SW lists some Yo! Sushi foods on the website, but none of these are there. 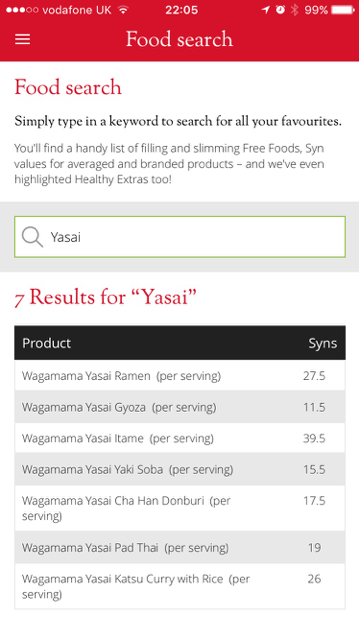 I've also tried searching for them under another brand name to get an average syn value, but can't find specific foods for the top 2, and the last one I can only find chicken katsu, but as it's only that that'll be different (I assume?) I would keep the syns the same. Katsu curry usually ranges between 15-26 syns, so I would account for at least 20 if I were you. Thanks! Yasai means vegetable so a yasai roll is really just a vegetable sushi roll. I've done a bit more digging online and most of the sushi rolls are 4 syns, so this is probably no different. Pumpkin katsu is pumpkin korroke renamed - those are 2.5. And apparently the chicken katsu curry is only 8.5 - since tofu and chicken are both free presumably the syn value would be the same for both? Can I ask where you found those syn values? I'd love to see them, I love Yo! Sushi! I would count the same syn value for either tofu or chicken, yes. Find more posts on sushi, syns.